20 charm squares for the "beads"
8 solid charm squares for the "sliders"
Start by arranging the layout of your charm squares in four rows, each having five beads and two sliders. I played with this quite a bit before deciding on my final layout. While I ended up putting each pair of solid charm squares together for ease of quilting later on, you could separate them if you like as you see in the picture above. Sew each row of charm squares together. I used a quarter inch seam allowance for all of my sewing in this project, by the way. Press your seams in one direction along each row. Once your rows are set, add your sashing between each of the rows. I attached one row to one piece of sashing until I had three pairs and one last charm square row; then I went back and sewed all of the pairs together. This helps me keep things a little straighter. Press your seams in one direction as you go. Now add the outer border. Sew a strip of sashing onto the top and bottom of your quilt top, then add another strip to each right and left side. Continue to press those seams. Once you've added the outside border, trim the edges so that you have a tidy rectangle. The easiest way to add a backing to your quilt is to make it all one piece of fabric. I would have used one piece of Central Park print for mine if I had one, but instead I sewed white fabric on either side of my one quarter yard strip of print that I had on hand. Use your own creativity to make this the way you want it, but do be sure that your backing is a little larger than the quilt top on all sides to make up for any shifting that happens during quilting. There's nothing worse than finishing your quilting and realizing that your backing is a little short around the edges. Make your quilt sandwich. Lay your quilt backing right side down and top it with your batting and then your quilt top, right side up. I use regular straight pins for this, but many people have other options. I like to start in the center and work my way out to smooth out any excess fabric as I go. For the quilting, I stitched in the ditch along the edge of every single charm square row. I then stitched along the border between each of the printed charm squares as well as stitching a border just a quarter inch inside each printed charm square. For the solid slider squares, I stitched horizontally in rows a quarter inch apart all along the inside. Refer to the pictures for clarification on this. Once you have finished quilting, remove any leftover pins and trim the edges of the batting and backing so that they match up with the edges of the quilt top. All you have left is the binding. If you are unfamiliar with how to make and attach your own binding, I refer you to Elizabeth Hartman's wonderful tutorial. I usually use straight grain binding. It has held up very well for my projects so far. And that's it! Please let me know if this tutorial is helpful to you or if you find any glitches in it. I'm hoping to add more tutorials in the near future. Enjoy! A friend of mine from church is an expert seamstress with skill levels beyond anything I hope to achieve in the next decade. When she heard that I had started dabbling in the world of sewing, she was thrilled and has been showering me with encouragement ever since. A few weeks ago she brought me a "care package" full of goodies, not the least of which was a foot high stack of random charm squares. When I went through the stack, I was so excited to find more than two dozen pieces from Kate Spain's beautiful Central Park collection for Moda. I tried several different layouts before finally having a brainstorm one afternoon last weekend. The result is this baby quilt: Abacus. The pattern is a modern take on a child's toy abacus. Each charm square is a "bead" and the grey areas are densely quilted to show the sliding movement from left to right. The sashing is simple white muslin, and I added a quarter yard piece of Central Park to the back for a little extra color. The quilt is bound in a grey Sea Star print from Emily Herrick's Going Coastal collection for Michael Miller. I love that this quilt will not only make a wonderful blanket for my youngest daughter's pack-n-play crib, but that I can also use it as a math tool for teaching my older daughters about counting, adding, and subtraction. It's been wonderful having my husband home for two weeks of spring break...I love his teaching schedule. It's given us time for lots of activities together as a family, and I've even gotten a little bit of extra sewing time here and there. At long last I've buckled down and started work on the girls' new bed quilts. I've been saving a set of Castle Peeps fat quarters by Lizzy House for months now. Funny how hard it is to cut into fabric that you love; I have this terrible fear that I'm going to ruin it somehow. Still, considering how much use these quilts will get, I'm sure it won't be long before I'll be making them new ones anyway. I'm cutting each fat quarter into three pieces, and each set of fabric will be used to design a different quilt for each girl. I need to make them unique so that they'll be easy for the girls to recognize at a glance, and as a bonus, it will break up the monotony of doing three in a row of the same project. This picture shows a section from my first attempt. I'm hoping to have this one done by Friday...we'll see how much work the girls let me finish until then! The parade of bags ends today with this little number that I made for Mouse. Since she's not yet two years old, I opted against the crossbody style I used for the other girls -- no need to give her anything handy to wrap around her neck. It's been pouring rain outside, so I'm afraid the pictures will have to be indoor ones today. For the outside, I used the orange Birds and Flowers print by David Walker from his Get Together collection for Free Spirit. Inside I put one of my favorites...the rows of green geese from Lizzy House's Red Letter Day collection. I love that you can see one of the few blue ducks on the print as you look just inside the bag. Here's the bag in use holding one of the first toys I ever sewed on our machine...a pink fleece "Mousie" for my Mouse. The orange chair, by the way, belonged to my mother when she was a little girl. I love having things in our home with that kind of family history. It's been a busy weekend; my parents-in-law are visiting from Arizona, so we've had a whirlwind of activity around here. I've managed to sneak in some work on a few things over the weekend that I can't show yet, but hopefully I'll be posting about them soon. Hope you all had a wonderful weekend! After making a Rapunzel bag for my daughter Bunny, I knew it wouldn't be long before my other girls would be clamoring for bags of their own. Bear has been begging the loudest this week, so I sat down to sew one for her yesterday. The exterior is Tree Stripes from Monaluna's darling Circa 52 collection. I lined the bag with some of Lizzy House's hedgehogs from Outfoxed, and I could not resist adding a small applique of Mr. Fox to the front of the bag as well. It's a small but sturdy bag, perfect for my little two-year-old. You can see it in action here with Tup the Meerkat enjoying the ride. I've sent an email and am looking forward to getting this prize package in the mail! The granny square lap quilt is done at last, and I'm so happy with the way it turned out. Rather than cutting the usually smaller squares for this pattern, I used five inch squares from the two charm packs of Salt Air by Cosmo Cricket that I've been saving for something special. I absolutely love the colors in this line of vintage beach inspired prints. They remind me of the barrels of salt water taffy I used to see at the Huntington Beach candy shop when I was a kid. After some debate, I chose a grey background for this quilt rather than the more typical white because it seemed to fit with the ocean theme as well. I kept the quilting very simple, machine stitching across the sashing in the middle and then hand quilting around the edge of each granny square with a thread color matching the center prints. It was the first time I've done any quilting by hand, and I'm glad that I tried it. It takes so much longer, but I love the way it looks. The quilt is bound in Lizzy House's Pearl Bracelet in red, a wonderful print for binding. I will definitely have to order more at some point. While I would love to keep this quilt, I'm happy that it's going to a good home...my grandmother's, appropriately enough. The granny square craze is happening for a reason; these blocks really are a lot of fun to make. I may have to tackle this pattern again in the next few months so I can have some of my own. Linking up to Fabric Tuesday & Work In Progress Wednesday. Well, I'd planned on having a finished quilt to show today, but time was against me. I've done so many mini quilts lately that I've forgotten how many hours I have to budget to finish a lap quilt...especially one with hand stitching on it. This sneak peek will have to suffice for now. Hope you all had a wonderful start to your week! Fabric Mutt has been in business for almost three months now, and I think it's high time we had a giveaway around here! Quilting Gallery is holding a Blog Hop Party full of great giveaways to celebrate St. Patrick's Day, so I thought we'd come along for the ride. I have over two dozen strips from Kate Spain's gorgeous Fandango line, most measuring 12 by 3 inches. They would be perfect for any number of small projects, and they are up for grabs to one lucky winner. Entries must be submitted between now and March 23rd. I'll announce a random winner on that Friday morning. I'm afraid this one's only open to United States' applicants -- sorry to my international friends. Please be sure to leave your email address in your comment if you're a no-reply blogger -- I can't get in touch with you otherwise! To enter all you have to do is leave a comment telling me what your favorite type of sewing project is: bags? quilts? pillows? What do you enjoy making? That's it; no other hoops to jump through. If you'd like to become a follower of my blog, I'll be thrilled, but it's not required to get in on the giveaway fun. If you're new, feel free to look around and get in touch if you have any questions or comments. Have a fantastic St. Patrick's Day! Last Sunday night I started working on the Uptown Clutch from Sue Kim's beautiful book Bags: the Modern Classics. Unfortunately I was both rushed and stressed at the time, and I made a dreadful mess of the pattern pieces as I cut them. I ended up setting the whole thing aside and promised myself that I would try to attack the project again later when I had time. This morning I needed a change of pace, so I pulled the pieces back out. I made a few changes and did the best I could to save it. It's a simple little clutch, nowhere near as fancy as it was originally meant to be, but I'm happy with it. I love the Parisian architectural print from the Etchings line by 3 Sisters for Moda., and I like the contrast of the solid green and gray with the patterned fabric. There's definitely room for improvement, but considering that this is my first clutch and that it started out as a total disaster, I'm marking this down as a success. On another note, I apologize for not posting quite as much this week. I've been working feverishly to finish a special project for my mother-in-law, Mary. Her dear friend Lana was recently diagnosed with advanced cancer, and the doctors have told her that she now has only a few months left to live. Mary, being the incredibly thoughtful woman that she is, gathered squares of fabric with loving messages written on them from all of Lana's friends and family, and she asked me to put them together in a quilt for her to enjoy. I chose not to post pictures of the quilt here due the private nature of the writing on it, but I would deeply appreciate it if you would remember Lana in your prayers as she and her family walk the difficult road ahead. She is such an amazing woman, and even now is continually reminding all of us to be thankful for every moment we enjoy on this earth. So go hug your children and loved ones and enjoy the rest of this day before you! It's been quite a weekend. We had the fantastic opportunity of hosting a tea at our home on Saturday for the ladies at church. It was a beautiful time of laughter and fellowship. My friend Betty brought quilts from her family to share with us -- some over a hundred years old -- that were made by her mother, grandmother, and great-grandmother. Most of them were gorgeously hand quilted, and some of the patterns looked surprisingly modern in design. It was amazing and humbling to look at such stunning quilts. Tonight my husband and I returned from a night away from the kids thanks to my wonderful parents who babysat for us. (To give you a clue of what a big deal this was, we had to do some serious figuring to remember when our last overnight getaway happened; we finally realized that it was December of 2008.) I wish I had a picture of the two of us together, but we didn't get the chance to have anyone take one for us. This photo was taken at the Santa Barbara Zoo, which was a really fun place to visit. It's been a crazy week, but I somehow I was able to finish this pillow yesterday between crossing other tasks off my to-do list. I knew that I wanted to make something for my friend that included a nod to her love of tigers. I pulled out my new fat quarters of Hello Pilgrim by Lizzy House, and decided to go all the way with a pattern of stripes for the pillow itself. This cheeky little tiger is leftover from the backing of the I-Spy quilt I made for my girls, the Escapees in Aqua print by Michael Miller. I love the way the background prints almost suggest a jungle setting. The back of the pillow is the same as the green print on the front, only in brown. The pillow has been such a hit with the family that they want me to make an entire set of pillows for the family room using Hello Pilgrim prints. I can't wait to get started. Linking up to Finish It Up Friday, Sew & Tell Friday, and Confessions of a Fabric Addict! A stack of bags to finish prepping for our church ladies' tea this Saturday. There's at least ten other items associated with that part of the to-do list, but I won't bore you with those details. A gift to make for a friend of mine featuring those great little tigers and that stack of Hello Pilgrim fabrics. Okay, this is actually part of the want-to-do list. I've been wanting to jump on the granny square bandwagon for a while now. I thought it might be fun to make them a little larger by using charm squares. I've been looking for the right project for these Salt Air prints, and I think I may have finally found it. Can't wait to start this quilt! Hope your want-to-do list is longer than your have-to-do list today! The I-Spy quilt that I've been working on for my girls is finally done, and not a moment too soon. They've been waiting to pounce on it ever since I pulled out the charm squares from my Ellison Lane Quilts swap. I went through at least a dozen ideas for this quilt, but in the end, I decided that simple was best. "After all," my husband said, "it's all about the game, right?" The grid of modern fabric squares is separated by strips of my beloved grey -- is there anything that does not look great with this color? -- and bound by Lizzy House's Pearl Bracelet in red and white. On the back I put a print which I absolutely adore, Michael Miller's Retro Escapees in aqua. I've been saving this one for a kid's quilt, and this was perfect. It's almost like having another I-Spy game on the back. I love the way the light shining through the quilt makes the back look like it's all lit up with Christmas lights. This is going to be a well loved quilt, I can tell already. All I had to do was toss it on the floor and say, "Alright, girls . . . it's all yours." And yes, all three of them did actually pounce. Post the big news about your award on your blog -- definitely the easiest task to accomplish! Pick five fantastic blogs -- each having less than 200 followers -- to be the next recipients of the Liebster Award. List their names on your blog and include links to their websites. Then be sure to leave a comment on their blog to let them know that they've won! Show your thanks to the blogger who gave you the award by linking back to them (you're awesome, Tink's Mom!!). Carla at Sew It Up, Baby is fearless when it comes to trying new things. She's participated in about a gazillion quilt-a-longs and swaps, and she has a multitude of beautiful projects displayed on her blog. I particularly love the single girl quilt she's working on right now. Katie at there & back gives new meaning to the word "multi-talented." All you have to do is look at her mosaic of projects for the month of February to see that this woman is amazing. Crochet, embroidery, quilting -- she does it all and shares it with a delightfully wry sense of humor. 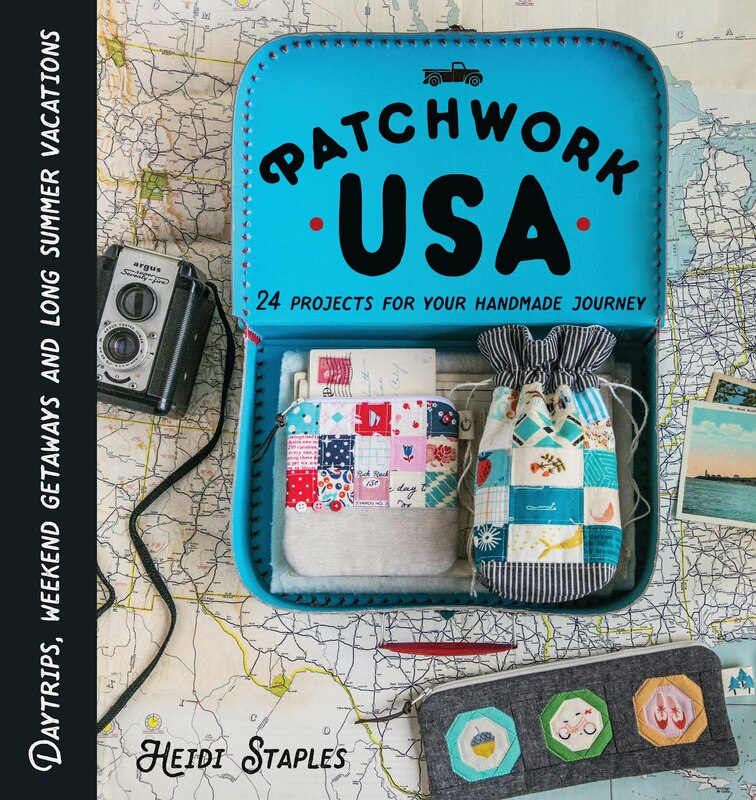 Jeanette at Stamp*Stitch*Create specializes in scrap booking, but her talents definitely extend to the sewing world. Her projects are so colorful and creative and just plain cute. And I'm absolutely in love with her quilt for the Modern Mini Challenge. Jacey at Jaceycraft is the place to go if you're looking for some great mini quilts. She's a whiz at both knitting and sewing, and you'll find lots of both on her blog. She's even kind enough to include a feature called "Food Friday" in which she shares all sorts of drool-worthy recipes each week (hello, brown sugar and pecan shortbread!). 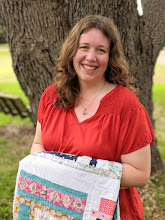 Deborah at Simply Miss Luella has one of the most adorable quilting websites online. The blog is named after her great aunt (how sweet is that?! 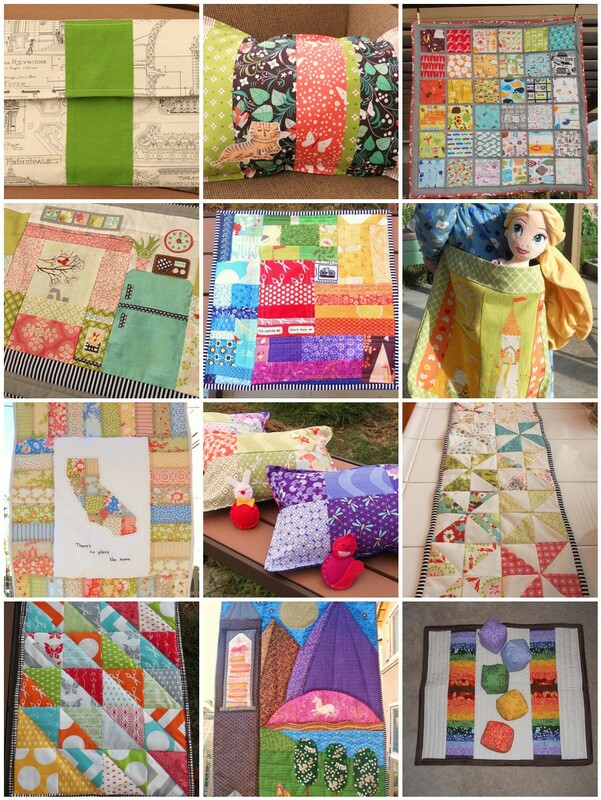 ), and it's chock full of quilty inspiration. I love looking at her colorful quilt blocks and crocheted hexagons -- all with a great vintage vibe to them. And there you have it. Be sure to check out the blogs above. They definitely deserve a look! The little ones are down for their afternoon nap, and Bunny is out happily working in the garden with my husband. I know that I really ought to be sewing right now, but all I want to do is sit and stare dreamily at my bounty that arrived in the mail today. I'm such a Lizzy House fan. Her prints are full of color and life, and they're all just a little bit sassy. I added in an extra Hometown print at the bottom. I love the look of newsprint on fabric. My very first purchase of colored solids...I'm so excited! It's the Woodlands inspired bundle from Sew Fresh Fabrics, and I can't wait to come up with a project for these beauties. Time to put on a little Etta James and get back to the sewing machine. Have yourself a beautiful weekend! Sometimes I think I've spent at least a third of my life in the kitchen. When I was a little girl, I loved watching my parents prepare meals for us, and they passed on everything they knew to my sister and I. "There's not a bad cook in the family," my dad always says proudly, and he's right. Even my husband loves to make his own pasta and sourdough bread from scratch when he has the time. Now that my three girls are no longer babies, they want to be part of the action too. I love seeing them standing on stools at the counter making lemon bread with Nana or juicing oranges with Daddy, and I tell them often that I look forward to teaching them how to cook when they get older. I have always found tremendous pleasure in creating food that others will enjoy, and all my hours in the kitchen over the years -- except perhaps those spent doing dishes -- have been happy ones. Out of that comes this mini quilt: Retro Kitchen. When I started working with two packs of Hello Luscious charm squares a few weeks back, I was taken with the perfect retro vibe of the prints. Having seen so many incredible examples of intricate piecing online, I wondered if it would be possible to piece together a kitchen. With a lot of trial and error, this kitchen was born. The quilt is 23.5 by 16.25 inches in size. The basic blocks of the kitchen are pieced, and the details were attached by applique. There is also a small amount of embroidery in here too. I tried to allow the prints themselves to suggest some of the objects in the kitchen like the clock, plant, and teapot (I just had to feature one of these cute little hearts on something). Only a few extra prints were added to create this; it's almost entirely made from the charm squares. I really wanted to include the radio also since I've always loved listening to music while I cook. The cake and cookbooks are a nod to my love of baking. Just seeing that layer cake makes me crave a slice! My husband suggested putting the branch with the little bird in the window. I love the sheen of the solid prints in this fabric line; they worked well for the main window as well as the appliance windows and refrigerator. And I could not resist putting a little mini quilt on the wall above the window. This quilt was such a joy to make. I'm thrilled to submit it to the Ellison Lane Quilts Modern Mini Challenge. Linking up to Finish It Up Friday, Sew and Tell Friday, and Confessions of a Fabric Addict.